In an industry first, INTI Universal Holdings Sdn. Bhd. 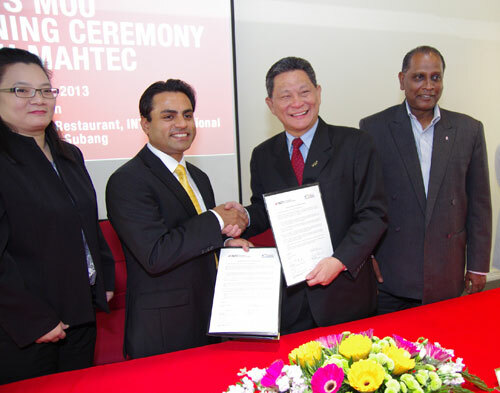 and the Malaysian Association of Hotels Training and Education Centre (MAHTEC) signed a Memorandum of Understanding (MoU) leading to MAHTEC’s industry certification for INTI’s hospitality graduates. As an award given by industry, the certificate is set to strengthen graduate employability. Rohit Sharma (2nd from left) exchanges signing documents with Cheah Swee Hee, Hon. Secretary-General of Malaysian Association of Hotels while Tan Ling Ling, Interim Chief Executive of INTI International College Subang (left) and Reginald Pereira, CEO of Malaysian Association of Hotels look on. With the MoU, both parties will collaborate to offer hospitality education programmes for mutual benefit. INTI is in the business of operating educational institutions where hospitality related courses are taught at INTI International College Subang, INTI College Sabah and INTI International College Penang. MAHTEC is committed towards human resource development and strongly believes that investment in human resource is the key factor for growth, sustainability, productivity and profitability in the Malaysian hospitality industry. “Education is an important ingredient in building knowledge and talent among students for the future of our country and society. In this regard, MAHTEC has played an important role since it was established by producing trained professionals in various hospitality fields for the needs of the industry. MAHTEC is proud of this achievement, and the signing of the MoU today is a testimony of our commitment to the industry,” said Y. Bhg Datuk Mohd Ilyas, President, Malaysian Association of Hotels. “The agreement with MAHTEC is the first step of many that we will take to elevate the standard of INTI’s hospitality programmes and raise the bar for hospitality education, training and development. It will lead to greatly enhanced students’ learning experience and work skills that will prepare them for a career with the best hospitality establishments in Malaysia and abroad,” said Rohit Sharma, INTI’s Chief Operating Officer. INTI’s Diploma in Hotel Management (DHM) programme is affiliated with Blue Mountains International Hotel Management School (BMIHMS), the number 1 hospitality management school in Asia Pacific and Australia*. The two year course provides a global study perspective and hands-on training opportunities for students as they are guided by some of the world’s leading experts in hospitality. INTI also offers Chicago’s No.1 programme for preparing students for culinary careers* via Kendall College’s Diploma in Culinary Arts. The 2-year programme offers a focus on practical and entrepreneurship skills in the area of culinary and food service operations, with specialisation in Kitchen & Larder and Patisserie. Hospitality education at INTI is shaped by an ideal balance of theoretical knowledge and practical training. Students will be trained to develop leadership qualities, confidence and resourcefulness, as well as learn how to analyse, strategise and make quick decisions. They will also gain valuable exposure outside the classroom with 5-star partner establishments that include the Renaissance Hotel Kuala Lumpur, Hotel Istana Kuala Lumpur and the Kuala Lumpur Convention Centre.